Esigo wine cellar furniture Box Version with Esigo 2 Box steel wine racks, service table with sink, wine-by-the-glass dispenser and Esigo Wss9 wine rack cabinet. Esigo wine racks are designed for users who appreciate a stylish and functional context, with elegant design shapes, when they choose a bottle or a glass of wine. Esigo proposes a range of different wine tasting and storage contexts for enthusiasts, all customisable to suit individual needs. For sector professionals there is an entire range of products to furnish wine bars, wine shops, wineries tasting rooms and retail shops, restaurants and hotels with customised solutions. 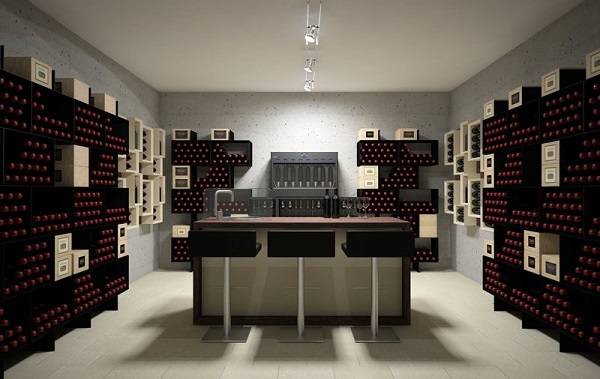 This wine cellar has been furnished with Esigo 2 Box steel wall-mounted wine racks, ideal for storing boxes of wine. The Esigo 5 wine bookcase has been used to display the bottles that owner which to draw attention to. It includes a service table with a sink, ideal for wine tasting activities, a wine-by-the-glass dispenser and Esigo Wss9 wine rack cabinet.